“I’m never going to use this!” Chances are, if you teach math, you’ve had a student say something along these lines. Yet, math is a vital part of our daily lives. From checking the temperature or deciding what to wear, to knowing if you have enough money to purchase an item or figuring out how long it will take to get somewhere, math is a part of everyday life. 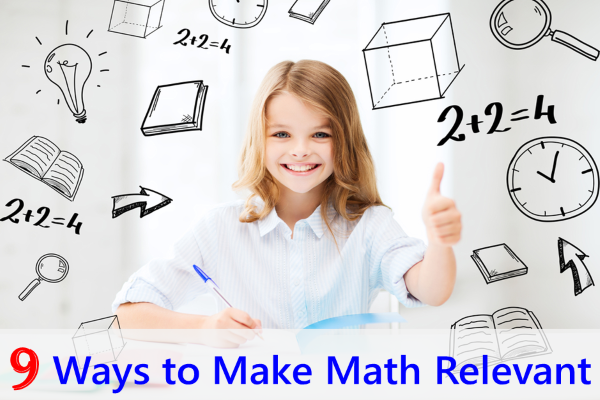 Here are nine ways to make math relevant for your students and inspire them to embrace math in the real-world. Connect math to social studies by following current events in the news. Students may be surprised by how frequently numbers are cited in news stories. Start by identifying a grade appropriate print, online, or video news sources like PBS NewsHour Extra. Then, have students keep a journal of articles that cite numbers and analyze how the data is presented as part of the news story. Quality math competitions will challenge students to apply their knowledge in ingenious ways. Encourage creative problem-solving and build teamwork skills by enrolling students in a competition like Odyssey of the Mind. If there is one math skill every person should master, it is money management. Although students typically learn how to add and subtract money, learning how to budget, invest, and manage debt are essential when it comes to ensuring a secure financial future. Get started with these ideas on teaching personal finance. Games are a fun way of incorporating math learning into the classroom while engaging students in play. Many classic board games help develop counting skills, number recognition, and fact fluency through the use of dice, spinners, and cards. Online math games are a high-interest activity for today’s tech-savvy students and many also support math standards and curricula. Planning a road trip can help students hone their math skills while also studying geography. Divide students into groups, provide a budget, and have them research, design, and present a print or digital travel brochure of their road trip. Require that each group provides a breakdown of costs, including miles per gallon for fuel, meals, lodging, and admission fees to attractions. Many kids love to cook. Apply math to daily life by having students practice their culinary math skills. Not only does cooking allow students to practice skills like conversions, fractions, and proportions, but they also get a tasty meal or snack at the end! Whether you have students who participate in sports, play sports video games, or simply love to watch a good game, statistics play a key role in athletics. Challenge students to watch or participate in a sport, then record and graph data about the game. Alternatively, look for sporting events that provide educational materials like these Iditarod math teaching resources. From patterns to frequency, music is mathematical. Elementary students can connect the arts and math by listening to music and identifying patterns. High school students can dig deeper into the mathematical structure of music by studying harmonics or looking at new ways of seeing music. Math holidays and theme days are a great hook for inspiring students to learn math. Join Global Math Week in October, connect math and literacy on Math Storytelling Day in September, or celebrate any of the multitude of math holidays throughout the year. How do you make math relevant for students in your classroom? Share your ideas in the comments. For more math teaching resources, try Help Teaching’s free math worksheets and math lessons. Lori Leclair is a freelance educational content developer. Using her classroom teaching experience coupled with her obsessive attention to detail, Lori crafts quality math and science materials designed for students and teachers. She currently serves as Help Teaching's Manager of Science and Math Content. When not devising and assessing curriculum materials, Lori can be found reading, camping with her family, or watching a youth baseball game from the bleachers. Although meant well and I hate to be negative the curriculum is e.g. requiring children to repetitively work out high-number additions/subtractions of (improper) fractions BORING, and outside of some very high-level engineering I have yet to see a “real-life” application for HCF/LCM or some of the algebra/indices they seem to “need” to learn in secondary. (Face it, any self-respecting engineer would run all that through a computer in real life). I’m good at maths, enjoy it, teach it. But a lot of the time it’s just not possible to make it “fun” for most kids. Like eating certain foods, they just have to do it, like it or not. They get a good grade, and then they can use programs/computers to do it for them the rest of their lives.